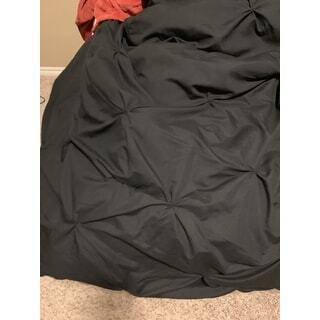 Purchased this comforter set for my son’s Christmas gift and it was better than expected as far as quality. He said he sleeps well...not too hot or too cold. Would recommend. A superb complement to any bedroom aesthetic, this beautiful comforter set features a pin tuck design and deep black color. Made of durable and cozy polyester microfiber, this generously sized set has thick, plush inner fill that's excellent for staying comfortable and regulated while you sleep. Beautiful, simple lines that gives a clean, classic look while allowing the freedom to add pops of bright color. I absolutely love this comforter set. I like the warmth of it. Its very soft and of good quality. Ive washed it several times and the color is still intact. The black hasnt faded at all. The pin tuck design is very classy and adds something special to the set. Great price for this comforter set. Bought this for my teenage daughter who is rough on comforters. It has held up wonderfully and none of the stitching has come loose! Really like the tailored look of this comforter set. Looks great on the bed. It is warm and comfy. However, I only gave it 4 stars because while the material is soft on the top, it collects lint very easily. But, other than that, its good! 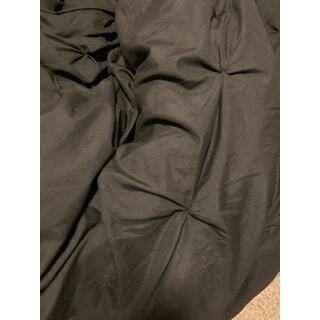 Very happy with the fabric softness of this comforter!! Fluffy and soft. My daughter wanted it for her dorm room. Easy to care for. I would highly recommend! this comforter is the best. love it. "Does this have good stitching in place to keep it from clumping? Is it alternative down? Is it machine washable?" This set is machine washable, we would suggest a gentle cycle / cold wash. The comforter has good stitching with a thick 280 GSM inner fill consisting of quality polyester, but doesn't quite reach the level that would be considered alternative down.